Schools officials tell NBC News the university will "exercise all options to recoup the funds." 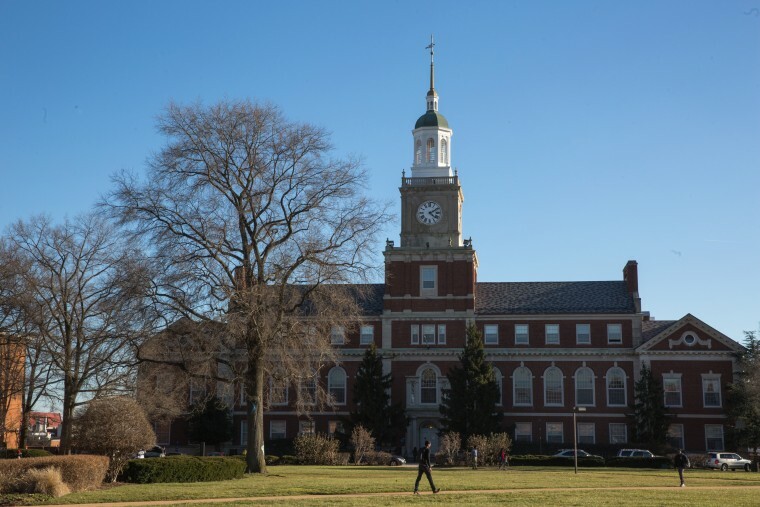 Six Howard University employees were fired last year for "gross misconduct and neglect of duties" following an independent auditor's investigation into misappropriation of financial aid funds, according to a statement Wednesday by the school's president, Wayne A.I. Frederick. The firings took place in September, but were not made public until Wednesday. According to the statement, some university employees received two kinds of benefits when they were only supposed to receive one. One kind of benefit is tuition remission, which waives tuition costs for employees who are enrolled in university classes. The other benefit was a university grant. The two benefits together added up to more than the cost of attendance, which resulted in the employees receiving improper refunds. Frederick said he was first made aware of the problem in December 2016. He later brought in an outside auditor to supplement the school's internal investigation. Howard completed its internal investigation of "individual employee actions" in September 2017, and said it would refer any actions for "criminal prosecution" when appropriate. The employees were not identified. The university is still working with outside experts to determine the total amount of misappropriated money during a nine-year span. The statement also lists a series of new policies and procedures as a direct result of the investigation's findings, including the hiring of a chief compliance officer. The announcement comes less than 24 hours after an anonymous post on Medium alleged financial abuses at the university. NBC News was not able to independently verify the specific allegations made in the original Medium post. The post was removed from Medium Wednesday afternoon. Howard University officials tell NBC News the president's statement Wednesday was not prompted by the Medium post. In a radio interview with HBCU Digest, Frederick said he was very "concerned" about the results of the investigation getting out because criminal charges against individuals involved are still a "possibility." The revelations of financial abuses comes at a particularly challenging time for Howard, a prominent historically black university, and its president. Sunday night, HUResist, a student-led activist group at Howard, posted a list of nine demands ranging from better university housing accommodations to greater administration accountability. The group also called for Frederick's "immediate resignation." Last year, faculty leaders voted "no confidence" in Frederick — though the vote's legitimacy has been questioned. In addition to voicing their concerns on the availability of university housing, Howard students have been critical of Frederick's visit with the Trump administration and his handling of certain student matters. School officials tell NBC News that the university plans to "exercise all options to recoup the funds" and that any money taken away from students is "unacceptable."